The Angela fullset came in Monday, a few minutes after I got home from work from suffering from a sinus headache from hell. On the left is the default doll. 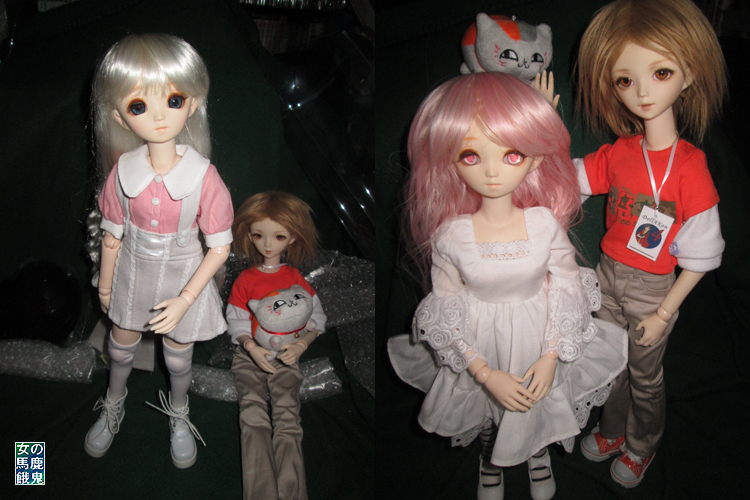 The small bust body, wig and eyes will go to Kimi, who wanted the body for a Volks head. Perfect split transaction!. The clothes and head are mine. On the right is the head with new eyes and wig on the large bust body I have had for about a month or so. The wig is the size the Parabox site said for the head but it's WAY too large. I have a smaller one ordered. I'm calling her Harumi, for the nice Parabox rep who helped me get Natsume. Harumi is wearing Volks Anime eyes in the colour called akane. She is my stand-in Dollfie Dream Dynamite girl and I am going to be treating her like she was a Volks. Next purchase is the full bodysuit to deflect stains. Natsume is currently wearing the short-sleeve version. And don't you just love it when a split goes perfectly! Yes, especially since I started the split somewhat late one evening and I got a taker within a few hours! I'm meeting her Friday as she drives through town to another destination so she can get her body. Thanks! I seem to be collecting pink girls lately. Someone told me I need to do a Madoka cosplay outfit for her. That was strange because I have a doll named Madoka I'm planning on selling soon. I need to buff out the scratches in her feet where I had to use a screwdriver to pry off her shoes - they had glued themselves to her feet.